Life is too short not to buy interesting fruit. It's called a Kiwano, and I'm kind of scared of it. Especially because, after bringing it home and consulting the internet, everyone seems to love the exterior and disdain the interior. That looks intriguing! Too bad the consensus is that it doesn't taste all the good. :| But I guess you can try a small bite, and see if you agree. I've heard that if you make a loud noise around a Kiwano, they startle and explode like a blowfish. What in the heck is that? I am confused yet intrigued. I think it looks pretty cool. Like an alien fruit. I bet it gives you superpowers. Like being able to control any pufferfish in a 3 block radius. Seriously Marse, why does all the cool stuff happen to you? Hello? 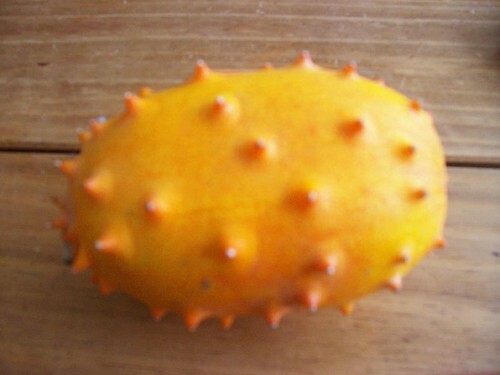 This is the fruit that Piper ate on Charmed that got her so sick that she nearly died. This also unleased that whole storyline with the Doctor who couldn't figure out why she was healed (it was the beggining of the end for her and Dan and the beginning of her and Leo) and ended up getting infected with Charmed Blood and powers? Ok, I really watch too much Charmed!